Since February 2015 New Zealand is free from departure tax! I am glad to announce that travellers will have less departure tax to pay in NZ airports in 2012 comparing with last year, so travel experience to New Zealand is getting less annoying. In the second half of 2011 Dunedin airport joined Auckland and Christchurch airports and replaced international departure fee passenger service charge (PSC) of NZ$12.78 each way which is now included in ticket price. In 2012 Queenstown, Wellington and Palmerston North airports also wiped departure taxes. In 2014 Hamilton airport become tax free. At least you don’t need to pay any additional taxes at airport and everything already included in ticket price. Since February, 2015 Rotorua airport also stopped charging departure taxes at airport. It was last airport in New Zealand which was charging fees at the departure. Hamilton airport – 5 included in ticket price. There is no international flights, domestic only. As you can see from this table your total payable tax can go up to NZ$37.50 if you are arriving to Christchurch (NZ$12.50 passenger services charge) and departing from Queenstown (NZ$25.00 departure fee). But if you are doing opposite your total taxes would be only NZ$12.50, i.e. arriving to Queenstown (NZ$0.00 passenger services charge) and departing from Christchurch(NZ$12.50 passenger services charge). For one person may be it is not big saving, but for families or frequent fliers it can make difference. Also you should know that at Hamilton and Rotorua airports there is domestic departure tax too, not only international departure fee. You need to pay a NZ$5 departure fee on domestic services out of these airports. UPDATE April, 2012. From 1st of April 2012 International Departure Fee is no longer applicable at Wellington Airport. If you have pre-purchased an International Departure Fee you can obtain a refund from Travelex at Wellington Airport by presenting your Departure Fee Sticker. UPDATE September, 2012. Somehow we missed this news but Queenstown Airport has wiped its NZ$25 international departure fee at the end of June. As airport chief executive said: “Removing the fee will greatly improve the experience international passengers have when leaving the airport.” He is so right! UPDATE October, 2012. It looks like this year is tax cut year. From 1st of October passenger won’t need to pay NZ$5 domestic departure tax at Palmerston North Airport, but landing fee will be increased by NZ$3 and will be included in the ticket price, so Air New Zealand wasn’t happy about it. UPDATE April, 2013. Talk about new departure tax in Christchurch started. Lets hope it will be only talk. UPDATE April, 2014.There is no departure levy at Hamilton airport. All taxes are included in ticket price. UPDATE February, 2015. No more departure taxes to pay at Rotorua airport. Read more here. New departure tax in Christchurch airport? Not so long ago existing international New Zealand departure tax of $NZ25 was wiped from Christchurch (CHC) airport. Everybody was glad about it. Of course these taxes didn’t disappear. At least once a year I am in transit at Riga airport to Middle East countries, so I didn’t notice they have some departure fees to pay at airport. This departure tax applies only to Ryanair passengers who has direct flights from Riga airport (RIX). 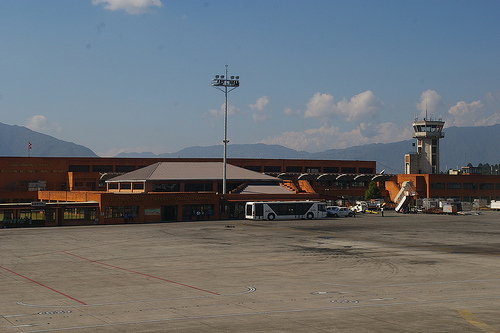 In most printed travel guides there is information about departure taxes you need to pay on departure from Tribhuvan (KTM) airport in Kathmandu. But from year 2010 there is no such departure fee any more for international departures. All taxes are included in your ticket. Thought you still need to pay domestic departure fee. As of April, 2013 this fee is 200 Rupees. So if you are flying from Kathmandu to Lukla or Pokhara be ready to have some spare cash to pay these taxes. You don’t need to pay departure tax in Australia as you are paying departure tax in New Zealand in some airports. All fees are included in your tickets, but only now I realize how big these fees are. In Australia it is not a departure tax. They call it Passenger Movement Charge (PMC). It was renamed as such from middle of1995 and that’s why I couldn’t find much information about it and from July 1, 2012 Australian Goverment increased this charge from $AU47 to $AU55. It is more then double of departure fee in New Zealand. With some exceptions everybody older then 12 years must pay this fee. When buying online not every airline shows “price breakdown” and this tax can be differently named by different airlines. Scoot airlines names it as “Government Imposed Pax Movement Fee”. Virgin Australia calls it by it’s name – “Passenger Movement Charge”. 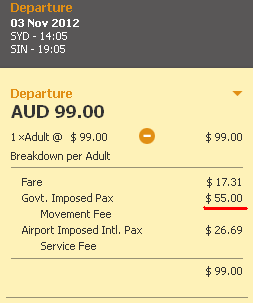 Other airlines like Qantas shows only total taxes you need to pay. According to the Tourism and Transport Forum, Australia now has the second-highest departure tax in the developed world (the highest for short-haul routes), with only United Kingdom charging more. With such high Australian dollar exchange rate it seams government don’t want more tourists to come to Australia.